Our mind is formed by a formidable complex network defined by the connections running between the more than one hundred billion neurons in our brain. Over the past decade functional and diffusion magnetic resonance imaging (fMRI and dMRI) have become key non-invasive windows into the workings of this network in terms of the functional and structural connectivity respectively. While the resolution provided by fMRI and dMRI is steadily improving, it remains an enormous challenge to statistically disentangle the massive amount of available information hidden in the data about the functional and structural whole-brain connectivity at the resolution provided by fMRI and dMRI. 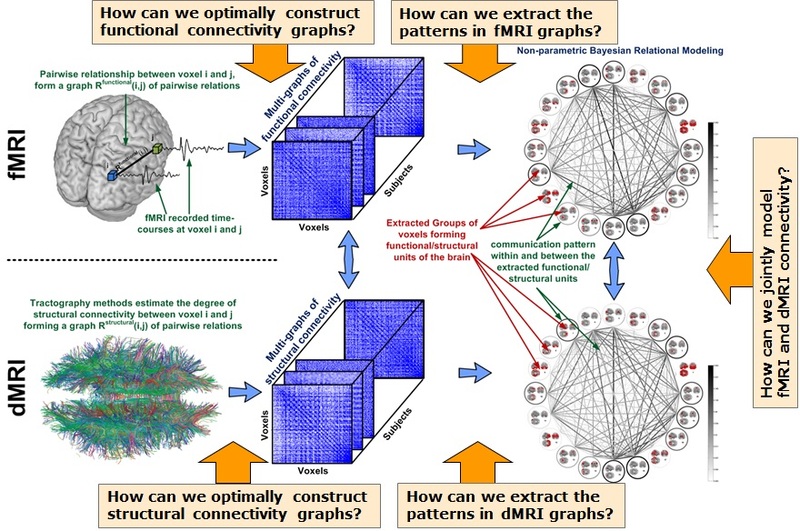 The aim of this project funded by a Lundbeckfond fellowship (2012-2017) is to develop statistical methods that allow us to infer this global functional and structural brain connectivity by exploiting the many important recent developments in large scale non-parametric Bayesian relational modeling of complex networks.